Why Victorian Nightgowns Are A Great Choice – delightfully exciting with a touch of whimsy, today’s vintage nightgowns bring together the best of both worlds - women’s sleepwear styles from a glamorous era of luxurious lace, ribbons, and frivolity with modern flare. Whether you’re shopping for your mom, sister, best friend, or wife, these beautiful nightgowns are a fantastic sleep wear favorite that can be enjoyed for years to come. Definitely splurge-worthy, the best gifts to give (and receive) are the ones that a person normally wouldn’t buy for themselves, and the Victorian nightgown is the perfect example. When shopping for themselves, most women tend to avoid luxury sleepwear, and instead opt for plain and practical everyday sleepwear basics like simple cotton pajamas, flannel nightgowns or even night shirts that are functional but don’t offer much in the way of luxury or pizzazz. It’s not often that they’ll indulge in sleepwear that’s unique and special, which makes Victorian style nightgowns such a great gift. 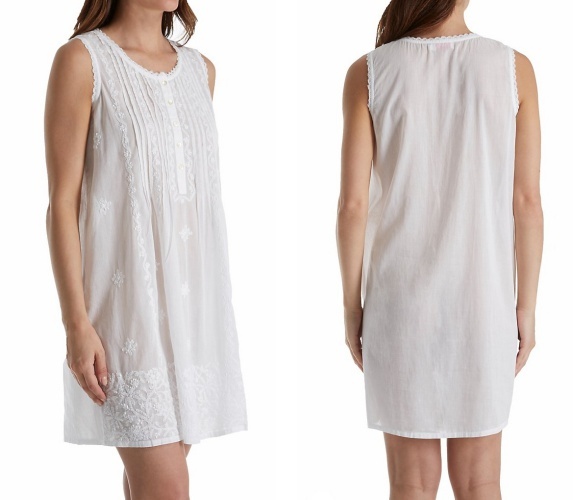 From sensational short nightgowns in easy breezy lightweight cotton to luxurious long nightgowns in the softest coziest flannel, this ladies sleepwear is traditionally trimmed in a dizzying array of ribbons, bows, eyelet lace, and appliques that’s hard to resist. An eco-friendly choice that’s breathable, cotton is soft and sumptuous, making this natural nightwear a popular choice with lingerie divas and newbies alike. What should you look for? 100% cotton is more comfortable than polyester blends that tend to hold the heat and don’t wear as well. If high-end luxury sleepwear is your preference, consider Egyptian cotton, which some consider the best in the world. 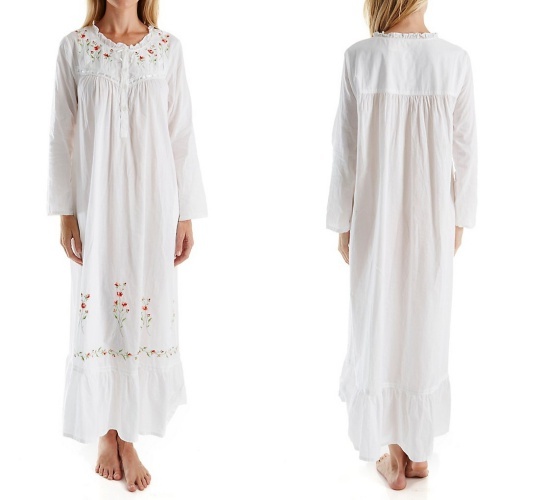 Prefer unprocessed, organic cotton nightgowns? Look for fabrics that are Oeko-Tex Standard 100 certified, and guaranteed free of harmful substances. Not sure which fabric to get? When it comes to nightgowns and sleepwear, touch is super important, so take your time in the sleepwear department, and opt for the softest material available. Refined attention to detail and gorgeous organic fabrics place Victorian nightgowns in a class of their own. From elegant floor-sweeping Victorian style nightgowns with embroidered necklines, full flounced sleeves, and traditional pin tucking to classic sleeveless gowns in classic shapes trimmed with scalloped lace, delicate ruching along the bodice, and an easy comfortable fit, these new style intimates with old world charm come in a range of styles that are just as perfect to sleep in as they are to lounge in. Luxuriously feminine subtle colors like crisp winter white, tiny and delicate pretty floral prints, and the palest shades of pink and baby blue make it difficult to choose just one nightgown. At the end of a long day when it’s time to relax, many of us reach for the same humdrum sleepwear that we’ve grown accustomed to. It’s easy and dependable - a favorite oversized sleepshirt, a cotton nighty that’s a little tired looking, or perhaps a pair of cozy flannel pajamas that are well-worn. While everyday faves are plain and practical, there’s nothing quite like the fantastic feeling of indulging in a little luxury. Slipping into a sensational Victorian nightgown styled with gorgeous lace trim and attention to detail is a wonderful way to tap into the whimsical world of classic romantic sleepwear. Elegant and grand, with a soft and feminine feel, these over-the-top womens cotton nightgowns are a wonderful way to add a little luxury to ones sweet dreams.